Claudia M. on Feistritzer: "The way to the dream saddle ..."
"Our saddle story is actually not very spectacular and yet it took only time until we were finally able to call our own saddle. My Feistritzer, who has been with me since his third year of life, has a fairly round physique and very little to no withers. Now I've moved into the country for a couple of years, when I came across Iberosattel by accident on various saddle searches. The footprint and also the appealing design immediately attracted me, so I wanted to get more information at Equitana 2013. The 1000 km track is quickly overcome and full of curiosity we are looking forward to visiting the Equitana. The first contact with the employees of the company Iberosattel is immediately friendly and the family atmosphere itself at the measuring stand noticeable. Of course I have to test all test models in detail and my initial enthusiasm has increased even further. Inside, I already choose my dream model and the beautifully designed catalog becomes a loyal companion for various saddle fantasies. After the offer on such a large fair is very large, it is easy to draw comparisons, but is for me firm - it must be an Iberosattel! Back home, a long stretch of thirst, marked by family fate, begins, but I save every dime on my horse and give me the best possible saddle. Deferred is not canceled and so it is this year in January finally so far, the appointment with the saddler is on. Unfortunately it is not so easy in southern Austria to find a representative of Ibero. The saddler has brought several test models to the selection, and my actual (presumably optically) favorite has then had to yield to the Amazona Dressage Comfort, which convinced both me and my horse immediately. With a self-assurance, he immediately moves loosely and joyfully under the new saddle and since this test saddle has never seen a horse before - we have not given it and kept it immediately. A very special pleasure, because I was already on a few months delivery time. Of course, the right accessory belongs to the saddle and so I ordered the stirrups and shabracks at Iberosattel. Since then, our Amazona Dressage Comfort has been a companion for all walks of life - at work on the pitch, during long walks in the countryside, at courses ... The deep seat and the not too big banana pads give me a safer seat which I would not want to miss. The monoblatt makes me really feel the classic dressage of my horse and thus communicates with fine help very playful. The quality of the saddle leaves nothing to be desired, the leather is supple, the cushions pleasantly soft, nothing presses and so are also many hours in the saddle an absolute benefit. 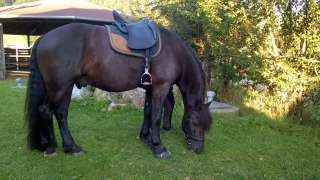 I would be glad about an Ibero-representative in Steiermark, because I am unfortunately still looking for a qualified saddler, which controls my saddle twice a year. In addition, I believe that the demand will continue to rise - advertising my horse and I do constantly!"